WAML | What Does WAML Mean? WAML means "With All My Love". The abbreviation WAML is used to end a text-based converation or message. When used between close friends and family members, WAML can convey great love and affection. However, it is also often used as a throw-away line between friendly associates and work colleagues. 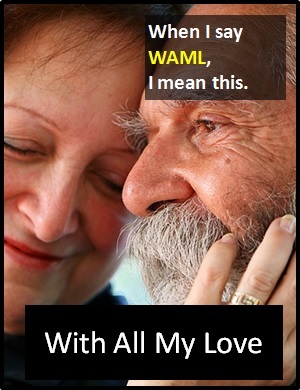 WAML has the same meaning as the abbreviation AML ("All My Love"). WAML can be a sincere expression of love. Ryan: I've just been made redundant and have no idea how I'm going to cope. Nicola: Oh no! You can count on me. WAML. Julian: I'm just about to board the 'plane. Daisy: See you in a month. WAML. WAML is an adverbial phrase. Adverbs give additional information about the time, manner or place of the action described in the rest of the sentence. WAML is an�initialism abbreviation. Technically, this means it is pronounced using its individual letters (i.e., "Dblyoo Ay Em El"), but it is not spoken using its letters. It is for efficiency in writing and not efficiency in speech. Before the digital era, we might have just said something like "With All My Love" instead of using WAML.